Driver linearization is a very important step in crossover setup. It ensures L/R drivers match each other and ensures they follow the crossover curve. Certainly, when you buy a pair a driver from the manufacturer, you want them to match them for you and if you buy it from a well known company, each driver usually comes with its own measurement curve. But if you check the curve, they seldom match perfectly. 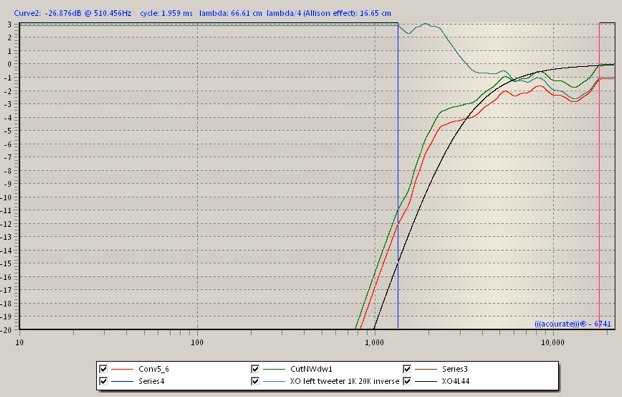 The next thing is that the drivers are also not a flat line over the usable frequency range. 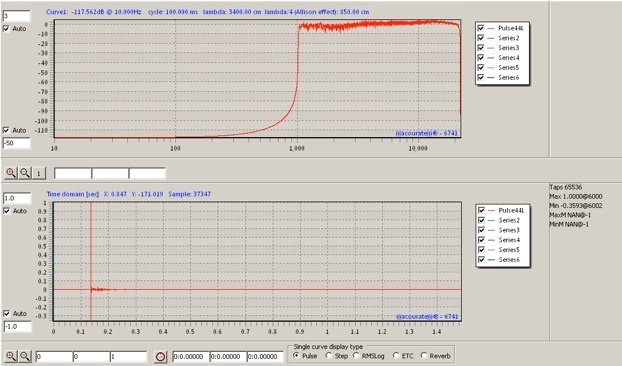 So, how can you ensure that it follows the crossover curve? These 2 problems can be solved by driver linearization and it starts with measuring the drivers. coeff: -1 simplify means that all filters are bypassed. materials between hard surfaces such as walls and floors to further reduce reflections. NOTE 1. If you cannot measure your loudspeaker outside then I strongly suggest you don’t include any data below 200hz in your linearisation since its almost certainly influenced by the room. Unfortunately this means corrections for baffle step in a 2-way will be incorrect but will be corrected for in the final step of room correction. Ideally to get best results you will be performing measurements outside. NOTE 2. Using the method described below it is extremely important that care be taken whilst performing the tweeter logsweep measurement since it will have no crossover filter fitted and will potentially be running full range. 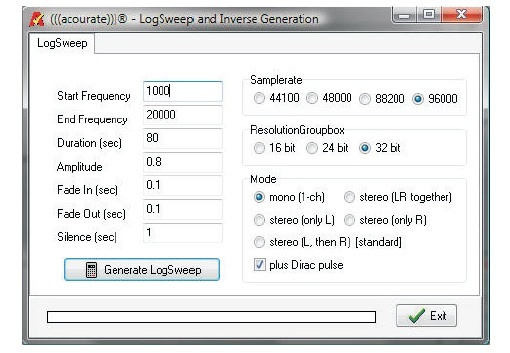 You must choose your logsweep start frequency with great care and I would suggest 1Khz as a minimum. You may also wish to move the microphone to 30cm or even 20cm distance from the tweeter and reduce level as further insurance. As always first test with low levels and listen to the driver for straining or audible distortion before jumping in. Destroying a tweeter will quickly dampen your enthusiasm so be safe. ADDITIONAL: There are no hard and fast rules to audio and that includes Acourate and just to prove this I would like to point out an email I’ve received saying that it may actually be best to perform driver linearisation with the loudspeakers in position within your listening room. My thought on this is to stick to the guide first and then if your curious or the results are not what you expected go try this alternate method. All you have to do is follow the steps outlined but with the loudspeakers positioned as they would be in your listening room. In this example I will detail the process for a RAAL 140-15d ribbon tweeter which is to be used as the high frequency driver in a 3.5way loudspeaker. Ideally you will use a program such as ARTA to capture frequency and distortion data but let’s assume a realistic situation where I have no such data available and instead, have only the data provided by the manufacturer. This is a least optimal situation but can still be worked with. 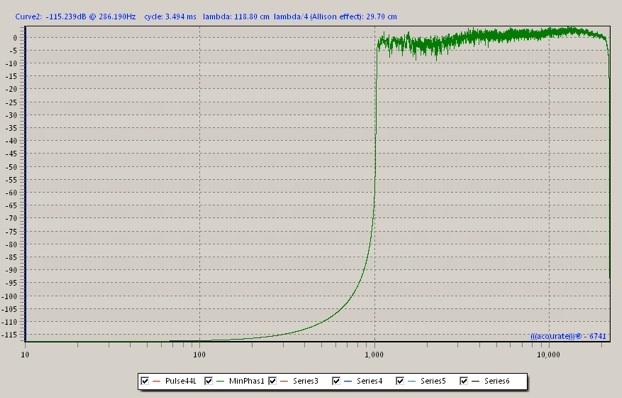 As we can see looking at frequency and distortion data the driver has a useable range down to at least 2Khz and still offers OK performance at 1Khz. This is a good situation since I have intended for the driver to cover 2.5Khz and above. I believe a logsweep starting at 1Khz will be possible and safe with the concession made that it will be performed nearfield at 30cm on axis and thus the overall power input to the driver will be low in order to get a suitably loud signal at the mic. Why am I doing a logsweep measurement from 1Khz when I’m intending to crossover at 2.5Khz you may ask.Well with 1Khz we have more than an octave below the crossover where linearisation will still take place so even outside the bandpass with the crossover filter applied we are getting correction taking place, this is essential for correct acoustic rolloff. After this we run the logsweep measurement into the driver with NO filter attached and record the result. After this we use the logsweep convolution process in Acourate(see early section for details on this). 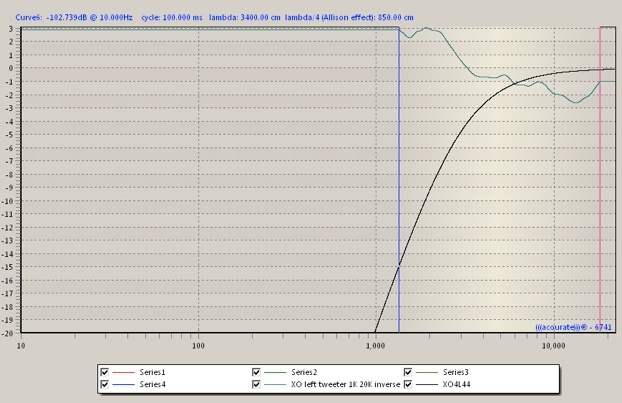 For this part of the recording, I am using 30dB gain in ULN-8 but I suspect that 40dB gain may also work. 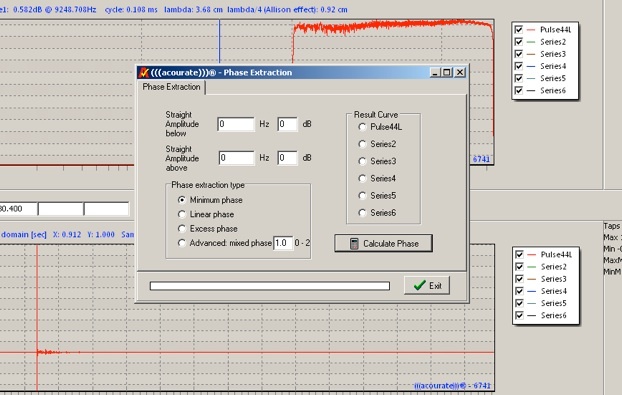 Now that you have recorded the logsweep and used the logsweep convolution function within Acourate you will have the pulse for your driver measurement and its ready to be worked on. Now we will effectively ‘smooth’ the response using the FDW or Frequency Dependant Window function. We perform this step in order to create a general correction behaviour and not compensate for absolutely every anomaly. Basically the aim is to look at the trend and correct for that. 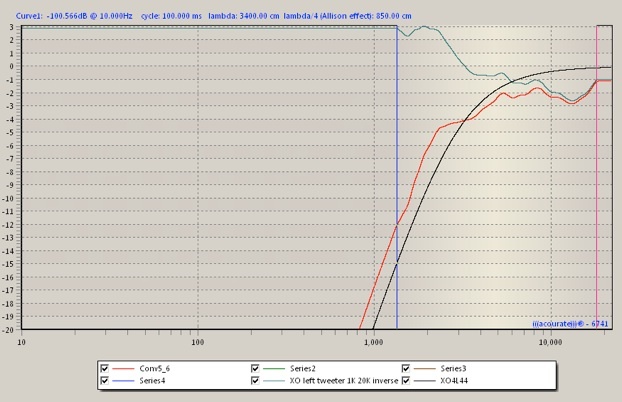 Interestingly Acourate allows for a linear interpolation of correction amount between low frequency and high frequency. So its entirely possible to have more extreme correction low down and less up high. This is explained below. FDW means a frequency dependent windowing defined in terms of cycles. 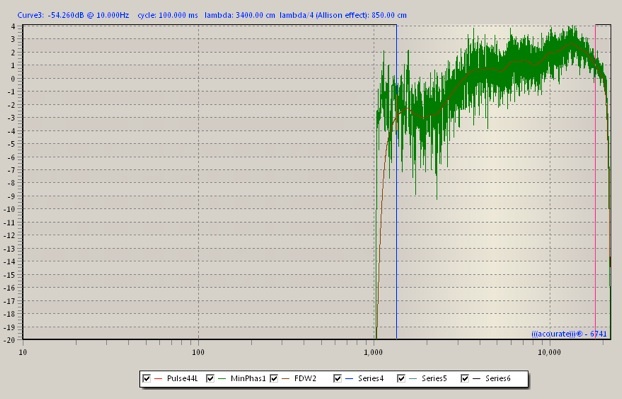 A 1kHz sine wave has a cycle time of 1 ms. So a FDW value of 15 means a window width of 15 ms.
With a 20 Hz sine wave the same FDW value means a window width of 15 * 50 ms = 750 ms. 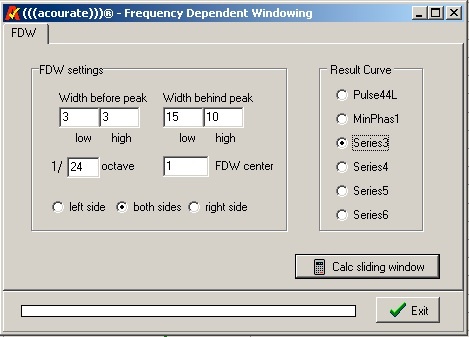 The parameters control the windowing of a given single pulse response. a/b is a half window on the left side of the pulse peak, c/d is a half window on the right side of the pulse peak. In normal cases you can simply set a=c and b=d = symmetric windowing. a and c define the width at low frequencies, whereas b and d define the width at high frequency (fs/2). In between the values are interpolated. 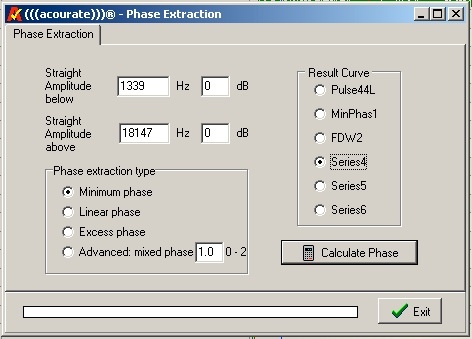 For better understanding load a pulse response and compute the minphase by TD-Function – Phase Extraction – minphase. Then apply FDW with e.g. 3/3,3/3 and 20/20,20/20 and 20/3,20/3. 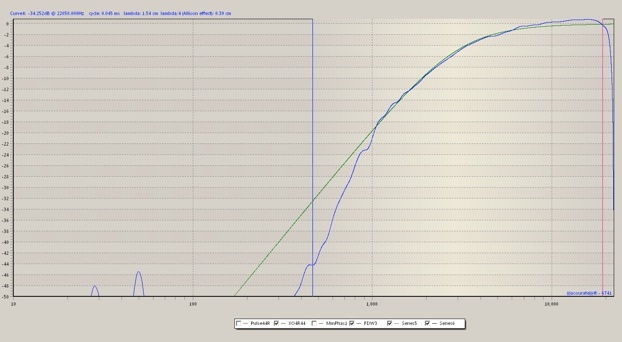 Then compare the resulting curves. 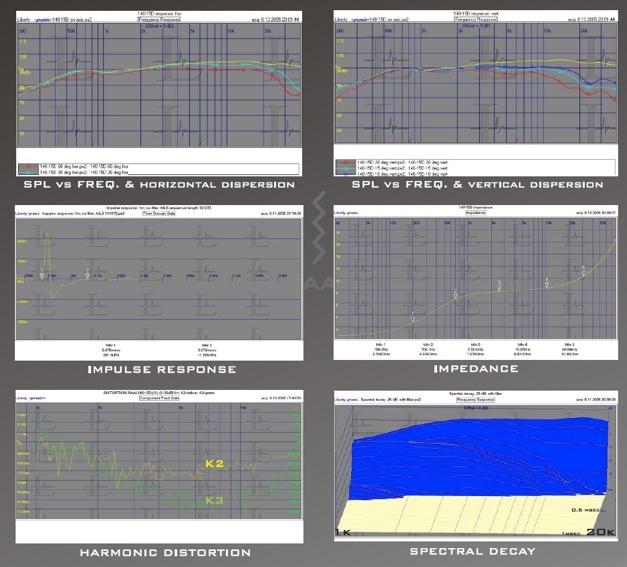 You will find that you can control the smoothness of the resulting frequency response. In reality you define by the FDW parameters if you focus more or less on the direct sound (represented by the pulse peak). So a wider window will include more reflections and reverb. Thus you get more oscillations on the frequency response. 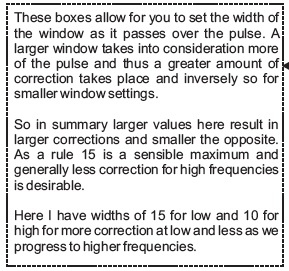 You should keep in mind that the pulse response part outside of the window is not taken for filter calculation. So at the end you may understand that only a small (frequency dependent) fraction of a pulse response around the pulse peak is taken for correction. Please note that the FDW center can sometimes be 1 when you are testing the tweeter and becomes 11 when testing the woofer. Here is the reply from Uli “this behaviour is normal. The shown value is the actual position of the pulse peak. The minphase peaks for a tweeter are close to position 0 or even equal to position 0. 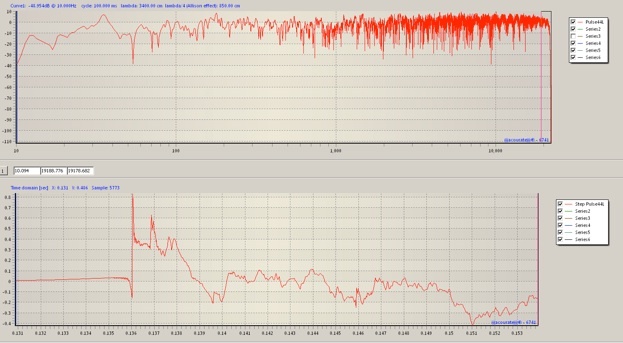 Wheras the pulse peak of a subwoofer may arrive much later. 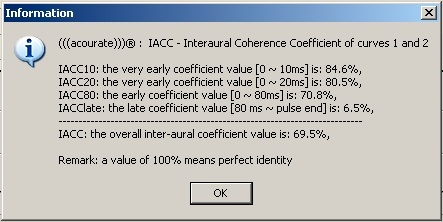 The parameter is mainly intended for information. Sometimes (in very rare cases with weitd system respnses) it happens that the peak at the beginning of a pulse is lower than a later following reflection. Then an automatic FDW as taking place in the macros is carried out at wrong positions. This needs a manual treatment. And so you can also override the FDW center parameter. But I do only recommend to use it if you really know what you are doing. So better ignore it.” so basically, don’t change it! Next we have to ‘cut out’ the interesting data and scrap the rest. Its quite easy to see where the data is relevant and where its not, I would advise against including the area’s at the extremes of the measurement since these are influenced by the window process. 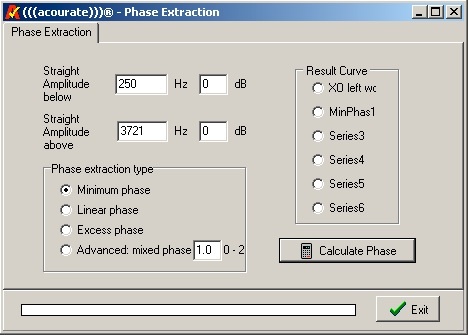 In this step we create and inversion or mirror image of the data we extracted in step 4. We do this because an inversion is the opposite of the original and when applied to the driver will theoretically allow for a more linear performance since the problems are partially cancelled with the inversion. This step assumes you already understand how to create a crossover within Acourate, if you don’t go back and read ‘Creating CrossoverwithinAcourate’ then move on. OK so you have your crossover filters ready. Load the relevant filter for the tweeter you just measured, in my case it was the tweeter for the right channel in my 3.5way loudspeaker so my filter is XO4R96. 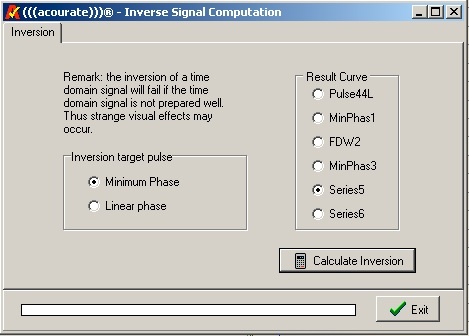 Now we need to combine the inverse with the crossover or more specifically; superimpose the inversion onto the crossover filter.To do this we perform a convolution. 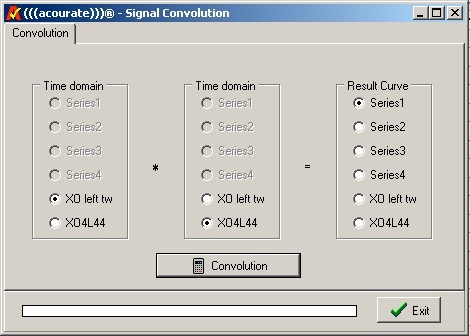 Press F9 within Acourate to open the convolution window and then proceed to set as shown then calculate. Right we have done all the hardwork and all that’s left is to prepare the filter into a format suitable for use in the convolution process for playback. First thing that needs to be addressed is that when we did the convolution in step 7 we doubled the number of taps in the filter so now we need to scale it back and set the main pulse into the center of the filter. 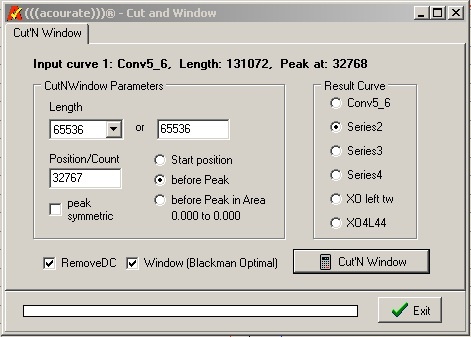 This is a very simple step and we use the ‘Cut&Window’ function. You are likely working with 65536 taps but if you are using more or less then the ‘position/count’ section needs to half sample rate or in this case 32768. Also be sure to set ‘before peak’. Once this is done simply calculate the result. The final step of our driver linearisation process. 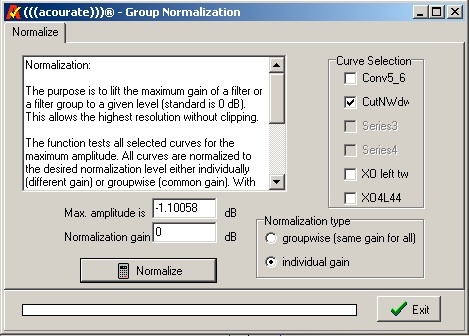 All we need to do now is adjust the gain of the filter so it doesn’t exceed 0dB and give rise to clipping. We use the‘normalisation’ function to achieve this. With this done we have completed driver linearisation and you should save the result of the normalisation as your final linearised crossover in a safe place. Again I recommend an easy to identify name such as XO4R96Lin. Here is the recording after linearization alone. The dip I mentioned in previous page has been corrected. The impulse response also looks better. The IACC has also improved from 61.8% to 69.5%! Mind you that this is with linearization alone! Is it worth linearizing woofer and sub? Let’s e.g. think about the FDW window sizes in macro1. 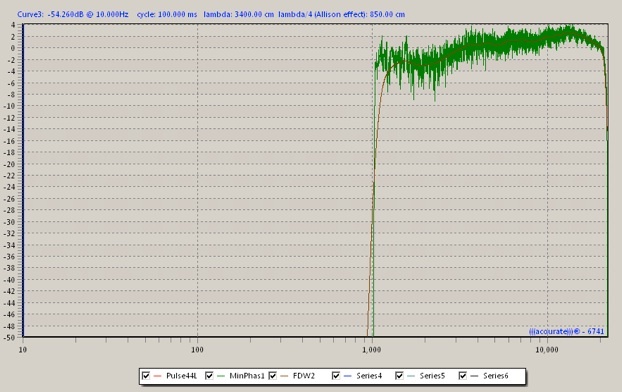 One cycle @ 100 Hz is 10 ms. So e.g. 15 cycles = 150 ms. The sound travels about 5.1 m. This is not a big problem compared to the room size. A 10 Hz wave would travel 51 m and this means several reflections forward/backward in the room. You get the thought behind? So you may try to linearize the woofer. But this will already include the room behavior which confusing the whole thing. So not advised. Is it possible to linearize only a portion of frequency? Quite possible and this is how you do it. What you see below is the inverse of a recording.